The Old Bakery01271 891076work Bed & BreakfastThe Old Bakery is a warm and friendly B&B situated in the delightful village of Georgeham, less than 1 1/2 miles from the world famous beaches of Croyde and Putsborough/Woolacombe. We have three bedrooms, all with en-suite facilities: one twin room, one double room and a flexible twin or double room using two divan beds. This room also has a sofa bed that can sleep up to two extra people. In addition, guests can use the kitchen throughout the day once we have finished serving breakfast giving a flexible self catering option. Groups booking all three rooms can opt to fully self-cater and should contact the owners to discuss. We also now have a fully self-catering cottage for two in the garden called The Garden Room. Contact us for more details. 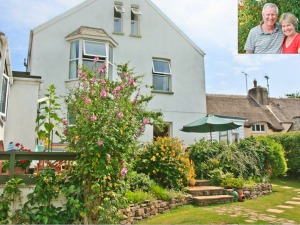 Friendly and comfortable B&B with three guest rooms, all en-suite, located in the centre of Georgeham very close to both Croyde and Putsborough. We welcome payment by bank transfer on-line (account details will be provided when booking), credit or debit card (but not American Express or Dinner).